If you live in a city or suburbs that are supplied by a municipal water system you don't ever think about your water supply. Your local water commission is responsible for keeping your water clean and flowing. If a water main breaks, you might be inconvenienced, but they will have a crew on site restoring service quickly. If you own one of the 15 million US homes that rely on a private water well, it's a different story. While you enjoy the luxury of unlimited water with no restrictions or monthly costs, if a problem arises, it's on you to fix it. Fortunately, solutions are rarely complicated or require digging. Most issues like pulsing or sputtering water or no flow can be traced to well pumps and not the well itself. Your well water professional can often get the pump working by fixing or replacing damaged parts. While well pumps are well made and generally last 10 to 25 years, they don't last forever and will eventually need replacement. If it's time for a replacement pump, read on for some tips on choosing the perfect pump. • Dug Well – Typically created by a backhoe, a dug well is 30 feet deep or less and is lined with stone brick or tile. • Drilled Well – Drilled wells can extend hundreds of feet into the ground. As a basic rule, for any well less than 30 feet deep you'll need a shallow well pump. If it's deeper than 30 feet you'll need a deep well pump. Pretty simple. Centrifugal pumps use an internal fan to generate suction to draw water from your well. Typically less costly than other types, they are installed above ground in a shed near the wellhead. This makes them easy to service. The problem is that they don't create enough draw to be effective in a deep well. If your well is less than 25 feet deep (dug or shallow driven) a centrifugal pump is a great choice. Submersible pumps are by far the most popular, partly because they're extremely versatile. They work in almost any well, shallow or deep. Submersible pumps are installed below the water, last for years and rarely require repair. But if it does need service, it must be brought to the surface. Jet Pumps are the most powerful and can deliver more water, faster than any other pump type. Like submersible well pumps, jet pumps will work with any well depth. There are two different types, single-drop, and double-drop Installation depends on the type you choose. Single-drop pumps are best for shallow wells and install inside an outbuilding or your home. Double-drop units are great for a deeper well. The jet assembly goes into the well and the motor remains above ground. While jet pumps are more expensive, they can be cheaper to operate and easier to service over the long-term. Choosing a replacement pump can be as easy as simply replacing the one you currently have. If your current pump is incorrectly sized to meet your current needs, or you are considering switching, for example, from a submersible pump to a double-drop jet pump, you may need to do a little more research. 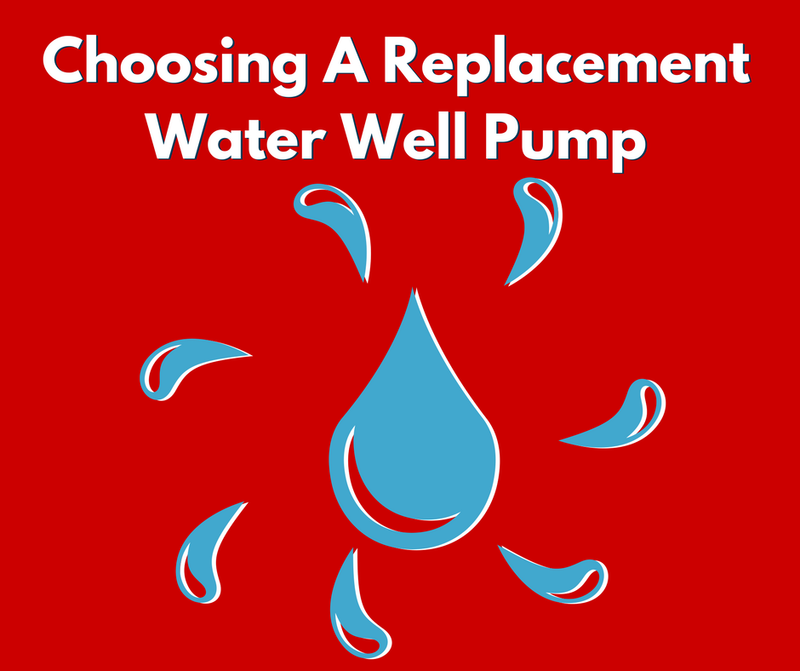 Your well water professional can answer your questions and offer options for a replacement pump. To determine the size of your current pump, if it is a submersible you can check your well log records, or bring the pump to the surface. You will find an identification plate that will list the make, model, and horsepower. If you have a jet pump, this information can be found on the pump motor located in the pump house or your home. To size your pump you'll need to estimate your family's water needs. A typical 3 to 4 bedroom home requires between 8 and 12 gallons per minute (GPM). To estimate your family's needs simply count all of the water fixtures in your home. Make sure to include showers, faucets, outdoor water spigots and all appliances that use water like dishwashers, refrigerators and clothes washers. To calculate GMP estimate that each fixture requires one GPM of water flow. For example, if you have 3 bathroom fixtures, 2 kitchen fixtures, a washing machine and 2 outdoor spigots you'll need a pump that can deliver at least 8 GPM. If you suspect that you may need a new well pump, contact the experts at Skillings & Sons. We can help you choose the correct pump and horsepower to meet all of your family's needs. We offer a selection of well pumps from the top manufacturers and can repair or replace any well pump.